We arrived at a campground outside Winnipeg in the late afternoon on Wednesday. The grey skies cleared out and blue replaced them, just in time for us to unload the bike and ride into Winnipeg for a quick look-around. We found The Forks, a meeting place where the Red River and the Assinboine River converge. There is a big indoor market there now, several restaurants and a boardwalk along the banks of the river. We didn’t see much as it was near closing time, and we became engaged in conversation with a retired school teacher who is now a publisher of children’s books and was giving away a few samples while trying to sell others. She was very interesting and excited about the books. When we finally walked away, a couple of books in hand, the other shops had closed. We returned to the campground with plans to return the next day. The next day was sunny and warm, perfect for a motorcycle ride back to The Forks to begin our tour of the city. We started at the new Canadian Museum for Human Rights. Little did we know that we would become so enthralled with what we saw there, it would be all that we’d have time to see. 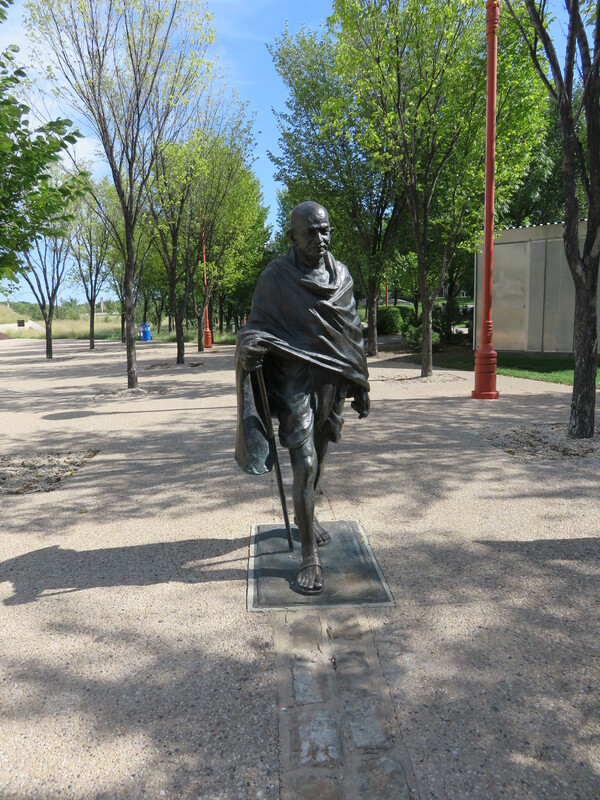 Along the path leading to the entrance of the very unique building, we were greeted by a bronze statue of Ghandi. At the desk we were offered tickets for an architectural tour of the building, which would start in fifteen minutes. 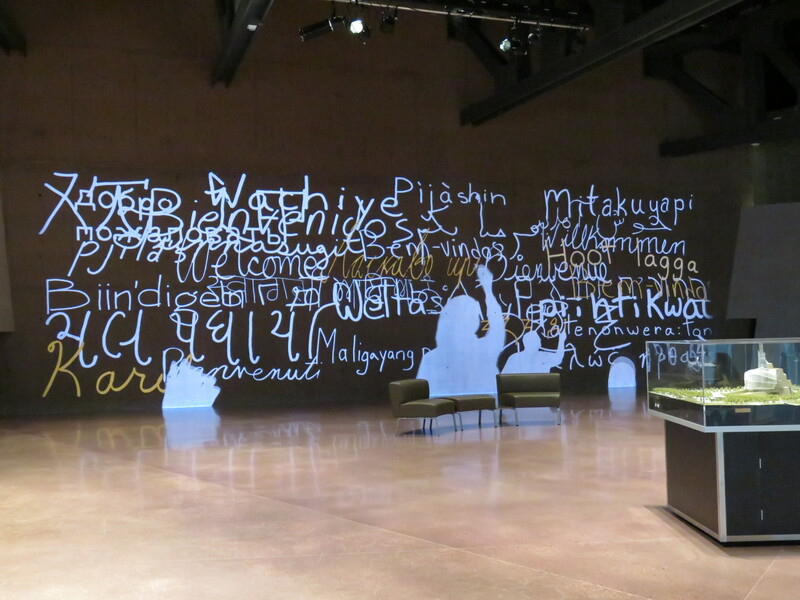 While we waited in the rotunda for the tour to begin, we watched with fascination as shadows of people of many statures, ages and sexes walked to a white board and wrote a greeting in their native language. Thirty-seven languages were represented. Every component of the building was inspired by the late a philanthropist Israel Asper, to represent some aspect of life. Once the architectural tour ended at the top of the tower, overlooking the city, we were on our own to tour the galleries.All were inspiring. Some were elating, others were depressing. The history of how inhumanly some humans have been treated over the centuries brings a tear to the eye, but changes have been made and the fact that more are being made, brings hope. However, to quote John Humphries, “There will be peace on earth when the rights of all are respected.” We still have a long way to go. 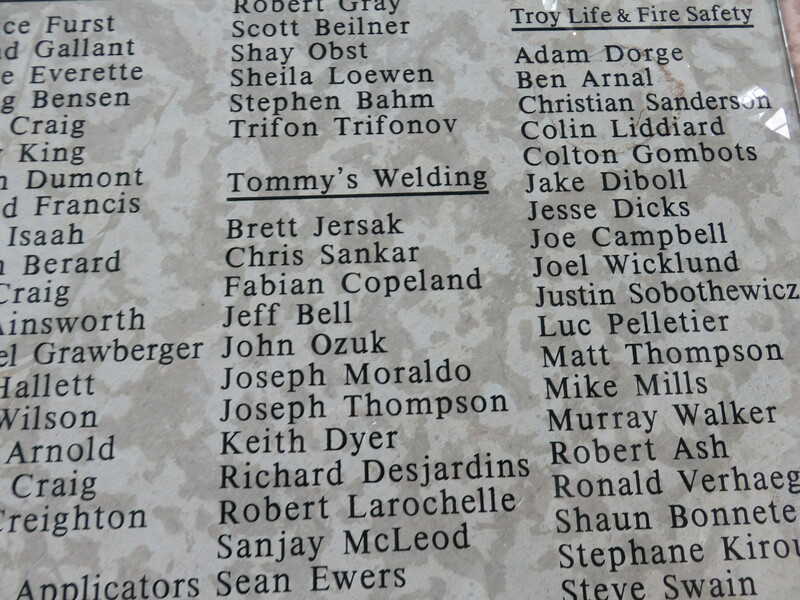 One thing that impressed me was the stone carvings in one gallery that listed the names of every person who contributed to the building of the museum, from architects to pipe fitters and electricians. They all were recognized. We took the stairs and ramps down to the main floor, learning new things in every gallery along the way. We finished in the private room dedicated to the interesting display of the Magna Carta, which was on loan for only another week. I couldn’t help but wonder when our current Prime Minister might have last read this document, if ever. By the time we got back to the bike it was too late to do anymore touring. Instead we relaxed over plates of pasta and salad at The Spaghetti Factory, which was a real treat since these restaurants have all disappeared from most of Canada. We were on the road in the motor home the next day, over some very rough roads, with strong winds blowing across the prairie. Our next stop was in Saskatoon where we spent a couple of nights with my cousin Terry and his wife Liz. 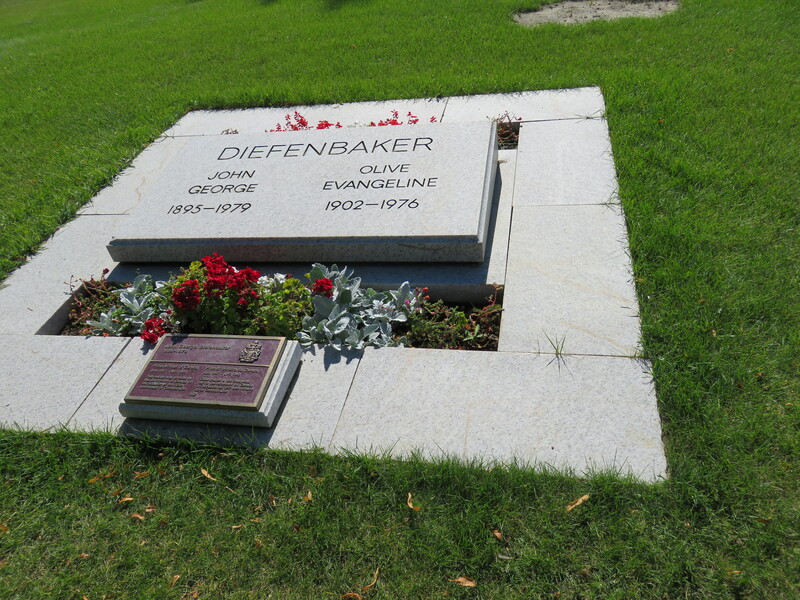 It was fun to catch up with them and we enjoyed the tour of Winnipeg that they gave us, including a look into the Diefenbaker Canada Centre at the University of Saskatchewan, where we learned some more facts about our country’s history that we hadn’t known before. 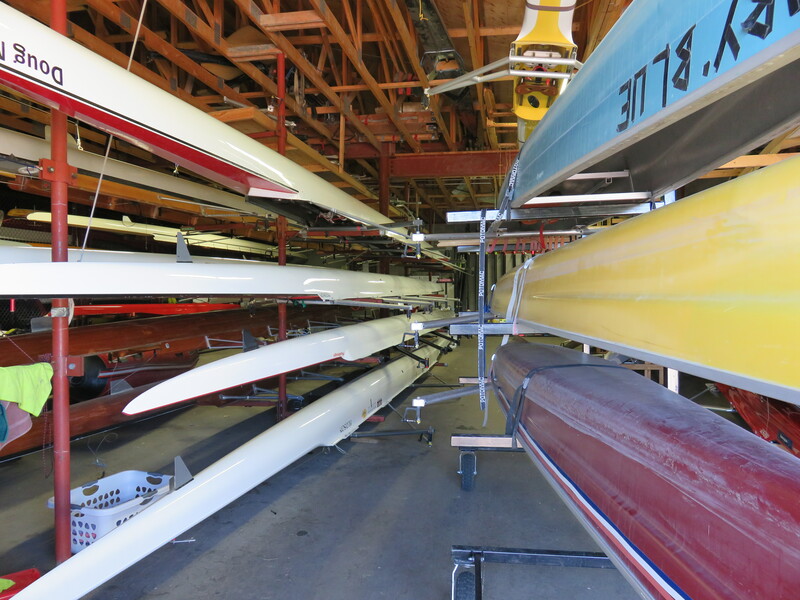 Terry showed the rowing sculls that he and members of the Saskatoon Rowing Club use. 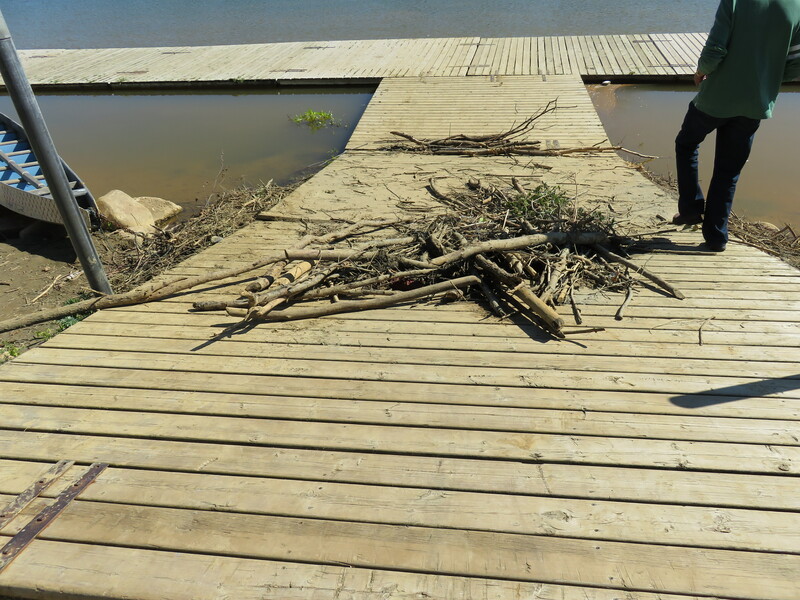 Some busy beavers have decided the dock is the perfect spot for their home, and everyday club members dismantle it only to discover it back the next morning. 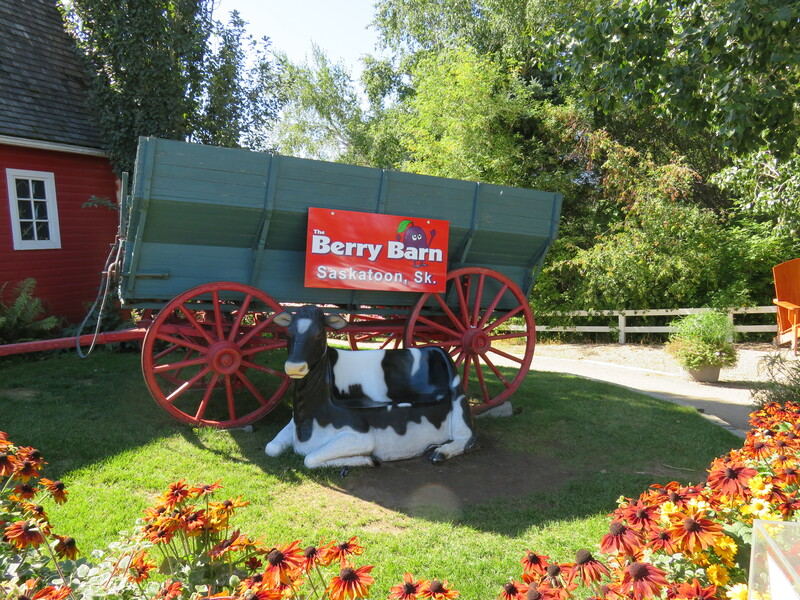 We had lunch at The Berry Barn, where all things Saskatoon Berries were on the menu. Jim was the only one to try a piece of pie after we finished our main course, but I had a taste. Hmm. This entry was posted in Active Seniors, Adventure, Community, RV Travel and tagged Canada, Manitoba, RVing. Bookmark the permalink. 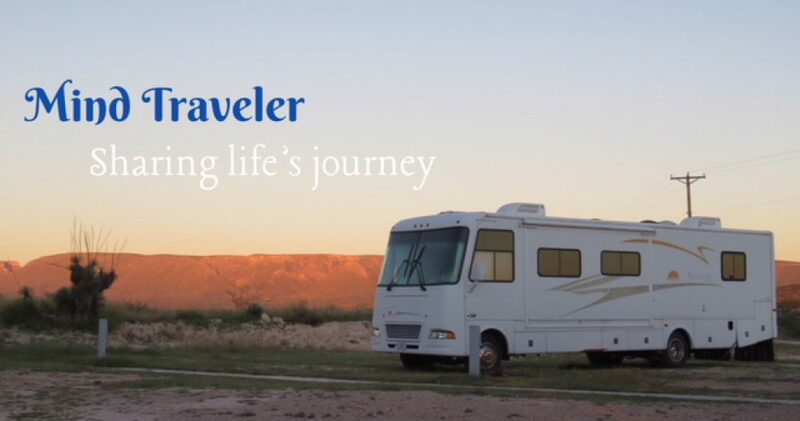 Love reading your travel stories and your pictures are great.